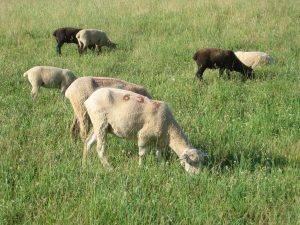 A few simple steps preparing for weaning can minimize the stress to both ewes and lambs in your flock. A few simple steps will help these lambs, and their mothers, get through weaning with a minimum of stress. Ewes baaing, lambs crying, and shepherds wishing for quiet: will the noise never cease! These are all signs that weaning is commencing. However, some of that baaing and crying can be minimized if shepherds take a few simple steps to prepare for weaning. And, this can limit the stress to both ewes and lambs in the flock. Weaning practices should start at least two weeks prior to the actual weaning process. By weaning, I am talking about separating the ewes from their lambs. Lambs should be started on some sort of solid feed at least two weeks before weaning so that they are adapted to living on their own. In addition, lambs should also be accustomed to drinking water. Solid feed often comes in the form of a high protein grain mix, but could also mean highly palatable and high protein hay. Weaning can occur in a number of different ways. Some producers like to wean early to take advantage of a lamb’s ability to more efficiently turn grain and hay or pasture into pounds of gain. It is more efficient to feed the lamb directly than to feed a ewe that produces milk that a lamb consumes. Early weaning generally takes place when lambs are 60 days old. Lambs should weigh at least 45 pounds at this time. Most ewes peak in their milk production around three to four weeks after the lambs are born. After that point, milk production decreases rapidly. Therefore, lambs should have plenty of grain and/or hay to eat by that point in time to get them adjusted over to eating solid feeds. Some producers will wean earlier to accommodate situations such as drought or the desire to breed back ewes more quickly. Earlier weaning may take place when lambs are just 30 to 45 days old. This can be challenging for drying off ewes at this time though. Lambs that are raised on milk replacer are often weaned at these early ages. On the other hand, some producers prefer a natural weaning method where lambs stay on pasture with their mothers until they are four to six months old. This greatly decreases the stress of weaning for both the ewes and lambs, but can also mean lower weight gains in lambs. When weaning, producers should prepare the ewes several days prior to the planned weaning date. Start by removing any grain from the diet of the ewes. And, switch to a lower quality hay. This abrupt drop in protein and energy levels will cause the ewe to decrease milk production. Some producers will also limit water for 24 hours after weaning, but ewes that are weaned from 60 day old lambs or older don’t necessarily need water withheld unless they are heavy milkers. Be careful of limiting water during hot weather! Lambs should have all their vaccinations prior to weaning. They should receive their first vaccination shot within the first month after they are born. A booster vaccination should be given three to four weeks later. De-worming [only if needed! ], castration, and tagging should also be completed well ahead of weaning as all these practices cause additional stress to the lambs at weaning. 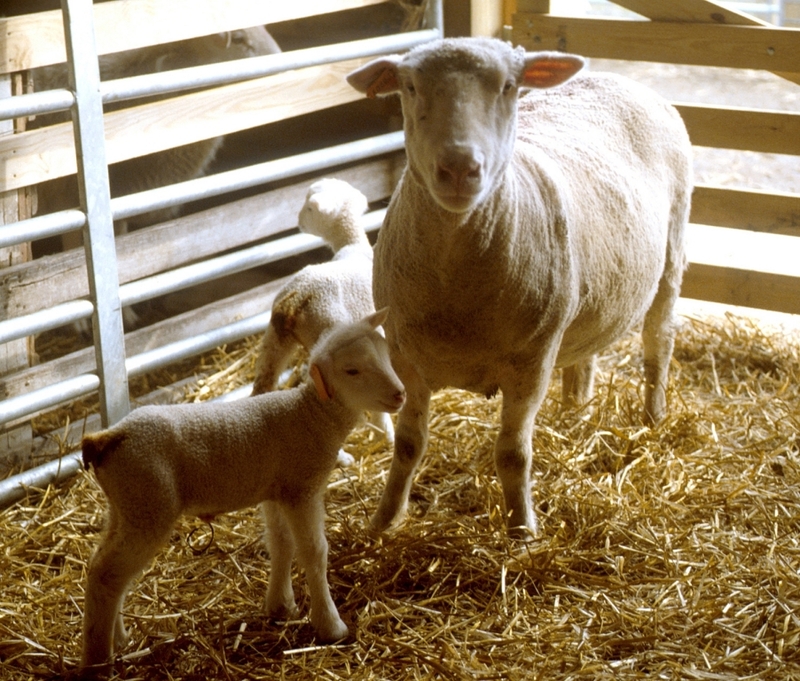 If unable to perform these tasks prior to weaning, producers should wait until several weeks after weaning when lambs are well adjusted to living without their mothers. Watch lambs closely for any signs of health problems for several weeks after weaning. This includes health problems such as pneumonia, scours, and coccidiosis. To decrease stress to the lambs, move the ewes to another location rather than move the lambs. The lambs should remain in the pen where they were raised because they are familiar with the surroundings and know where to find feed and water. This results in less decrease in feed and water consumption and thus less weight loss in the lambs in the first few days after weaning. Ewes should remain on the lower quality hay until their udders begin to shrink and dry off. For the first few days after weaning, be sure to look for any signs of exceptional swelling or redness. This can be a sign that mastitis is present and will need to be treated. If a ewe is very uncomfortable, some milk can be removed from the udder to lessen the pressure. Never remove all the milk as this will continue to stimulate milk production. Some simple steps prior to weaning can greatly reduce the stress for both ewes and lambs. And, this can result is less hearing aggravation for the shepherd and better weight gains in the lambs. Posted by Braden Campbell at 8:00am March 6, 2019 Posted in Management and tagged Management, Reproduction. Bookmark the permalink.